Volvo, one of the highly acclaimed luxury car maker in the world has came up with the facelifted version of its sedan model Volvo S60. This is a luxury sedan and it has received some major cosmetic updates in terms of its exteriors. The company has refurbished the exteriors of this luxury sedan, while making quite a few tweaks to the interior section as well. Most importantly, this sedan has been blessed with sophisticated safety aspects that enhances the protection of the car as well as the occupants, when the vehicle is commuting under a speed level of 50 Kmph. There are currently three trim levels available in the model series out of which the Volvo S60 D5 Summum comes as the top end variant and it is blessed with a five cylinder based 2.4-litre diesel power plant, which is incredibly powerful. This facelifted version gets some of the exciting new features including a digital instrument cluster with active TFT crystal display that comes with overall three graphic themes. Also the company has blessed this new model with new leather upholstery along with LED daytime running lights, integrated dual exhaust tail pipes and various other aspects. 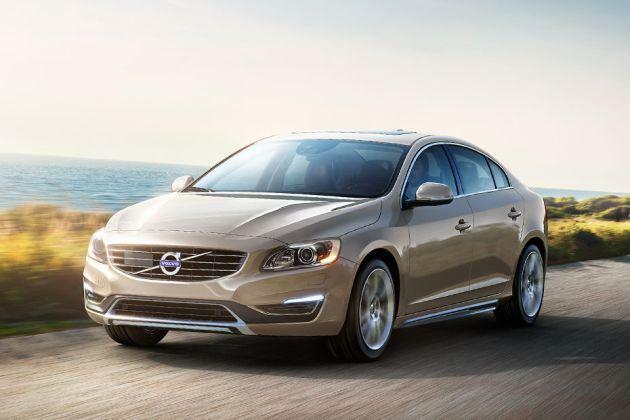 By launching the updated version of Volvo S60 luxury sedan model in the country, the company has sent a clear signal to the other automobile companies in the Indian automobile market, that the competition is now going to heat up. Coming to the exteriors, this Volvo S60 D5 Summum trim has been bestowed with captivating exterior features that has an arresting design, which will certainly impress the buyers in the first impression itself. The front facade of this luxury sedan looks very refreshing with a refurbished headlight cluster and an improved radiator grille. The design of the headlight cluster becomes sleek and it is incorporated with projector style headlamps. The size of the radiator grille is enhanced, which makes it look more pronounced. On its frontage, it received a sporty bumper that has been incorporated with an air dam and fog lights that beautifies the front profile. Volvo has also blessed the front facade with LED Daytime running lights that adds more beauty and striking looks to the front. The side profile of this sedan looks very decent with sleek and expressive design. There the wheel arches have been fitted with 17-inch Pandora style alloy wheels, while the doors are well equipped with body colored handles and the outside rear view mirrors. On the rear profile, the boot lid is very expressive that is blessed with company and variant badging with chrome garnish. The taillight cluster design is very unique that dominates the entire profile and makes it look stunning. The company is selling this sedan with four color shades including Passion Red, Power Blue, Vibrant Copper and Crystal White. When it comes to the inside section, this Volvo S60 D5 Summum trim has been blessed with all new leather seats that has great support for the occupants all the way from shoulders to the thighs. These new seats fitted inside the cabin will help the driver to stay firmly in position even when cornering fast. The Swedish automaker has blessed this particular sedan with luxurious interiors with great fit and finish that makes the interiors incredibly stylish. One should step inside this vehicle where you can find the three spoke steering wheel that is accompanied by paddle shifters along with audio control functions incorporated on it. This luxury sedan is also offered with a digital TFT instrument with three mode graphic themes such as ECO (Greenish), Performance (Sporty Redish), and Elegance (Amberish) . There are some number of utility based functions incorporated inside this four wheeler that will make the drive extremely comfortable and fascinating. The Volvo S60 D5 Summum top end diesel trim has been powered by a sophisticated 2.4-litre diesel motor that is blessed with 5-cylinders and accompanied by a turbocharger. This turbo diesel mill comes with a total displacement capacity of about 2400cc that allows it to churn out a commanding power of about 215bhp at 4000rpm, while generating a peak torque of about 440Nm in the range of 1500rpm to 3000rpm. Volvo has skillfully fitted this engine with an advanced 6-speed geartronic transmission gearbox that sends the power to the front wheels and delivers a superior performance. This sedan has the ability to return a peak mileage of about 21.73 Kmpl of mileage, which is the best in its segment. Recently introduced Volvo S60 D5 Summum variant has been bestowed with a proficient braking system in the form of discs brakes fitted to its all four wheels. This proficient disc braking mechanism gets the further assistance from emergency brake assist system. The speed sensitive steering system blessed to this particular variant is highly responsive that provides instantaneous response to the driver even under the low speed levels. On the other hand, the company has blessed this trim with a laser assisted braking system that will pre-charge the brakes and applies them automatically under the 50 Kmph speed level to prevent collision. The comfort features incorporated inside the cabin are absolutely luxurious and perhaps the best in this segment. This particular Volvo S60 D5 Summum trim gets some of the high quality comfort features that takes the level of luxury a notch higher. The list of these sophisticated functions include electronic climate control system with air quality control, sun roof, leather seats, laminated front windscreen, illuminated vanity mirror for passenger and driver, 6-way adjustable passenger seats, heated front seats, rear armrest with cup holders and storage, automatically dimmed inner mirror, 3-spoke leather wrapped steering wheel blessed with paddle shifters , textile floor mats, sun curtains for rear window and lots more. Apart from all these, the company also blessed this particular trim with a sophisticated audio system incorporated to a 7-inch screen along with AUX-In, USB and a remote control system. As far as the safety functions are concerned, this Volvo S60 D5 Summum top end variant has been rolled out with a list of functions that offers unparalleled protection to all the occupants inside. The laser assisted automatic braking system is perhaps the most sophisticated safety function ever designed by Volvo. Apart from this, the company has equipped the safety features including air bags, intelligent driver information system, whiplash protection for front seats, parking assist system and other advanced functions. Pros : Best in class safety features, striking new appearance. Cons : Interior design can be better, price tag is quite high.